Thursday, 6 May, was the date chosen for the Episcopal ordination of the Coadjutor Bishop of Ondo, Rt Rev Jude Ayodeji Arogundade. The principal Consecrator was the present Bishop of Ondo, Rt Rev Francis Folorunsho Alonge. He was assisted by 30 bishops and more than 300 priests. Before his nomination as Bishop, the then Fr Arogundade was ministering in the Archdiocese of New York, USA. Cardinal Egan, Emeritus Archbishop of New York, was due to attend but he had to cancel for medical reasons. Among the concelebrating priests was SMA Superior General, Fr Kieran O’Reilly, who taught the new bishop at the Ss Peter & Paul Major seminary (see photo). Fr O’Reilly is on a pastoral visit to western Nigeria and took the opportunity of his visit to attend the Episcopal Ordination. The open air ceremony took place in the grounds of the Don Bosco College in Akure and was a colourful, vibrant five-hour celebration. The Coat of Arms of Bishop Arogundade features the Shamrock, in recognition of the many Irish missionaries, including the SMA, St Louis Sisters and Irish lay teachers who evangelized this part of Nigeria. Though it was a wonderful celebration it was tempered by the fact that the Bishop’s father had died just a week before the ceremony. No doubt he was looking down on his son from his place with the Lord. Bishop Orogundade’s mother was present and received a gift of a Rosary blessed by the Holy Father, Pope Benedict XVI. On 12 January 1943 the Vicariate of Ondo-Ilorin, consisting of the Civil Provinces of Ondo and Ilorin, was carved out of both the Vicariate of Asaba-Benin and the Vicariate of the Bight of Benin. Bishop Thomas Hughes SMA was the Vicar Apostolic. In 1950, this Vicariate of Ondo-Ilorin became the Diocese of Ondo. Bishop Hughes now became Bishop of the new Diocese. On his death in 1957, he was succeeded by Rt Rev William Field, SMA who was consecrated Bishop on 27 April 1958. Less than two years later, on 20 January 1960, the Prefecture of Ilorin was carved out of the Diocese of Ondo with Bishop William Mahony SMA as its first Bishop. On 10 October 1971, Rt Rev Michael Olatunji Fagun, became the first Auxiliary Bishop of Ondo Diocese. When the Diocese of Ekiti was carved out of the Diocese of Ondo on 10 October 1972 he became the first bishop of Ekiti. On 21 April 1974, Rt Rev Francis Alonge was ordained as the Auxiliary Bishop of Ondo Diocese. When Bishop Field retired, in 1976, he was succeeded by Bishop Alonge. Thus the local Church was handed on and now led by ‘sons of the soil’. Bishop Alonge was installed as Bishop of Ondo on 22 August 1976 which took place at place in the Sacred Heart Cathedral. (Editors note: Bishop Alonge appointed Fr Hugh McLoughlin SMA as his Vicar General and a letter from Fr McLoughlin, now retired in Cork, to Coadjutor Bishop Orogundade was included in the Episcopal Ordination booklet.). The Diocese of Ondo covers the entire Ondo State area, i.e. 15,518 sq miles. With a population of 3,225,255, the number of Catholics is less than 10% (265,000). The number of parishes, Mass centres and priests has grown tremendously over the years. Today there are 42 Parishes and Mass centres, with 84 diocesan priests serving within and beyond the diocese. The Diocesan Headquarters is Akure, the Ondo State Capital. Priests and brothers from the Society of African Missions (SMA) were the first Catholic evangelizers in this part of Nigeria. Today, as the above statistics show, the local church is able to stand on its own feet. And so the SMA has moved on to more needy areas. However, through the kindness of Bishop Alonge, who wanted to retain a link with the founding missionaries, the SMA has pastoral care for the Parish of St Therese of the Child Jesus in Akure. Fr Matthew O’Connell, a missionary for 56 years, looks after the parish and the Shrine to St Therese which he has been building for several years. Though the SMA has diminished there is still a great need for evangelization, as Bishop Arogundade acknowledged in an interview with the Catholic New York newspaper. Jude Ayodeji Arogundade was born on 2 June 1961 in Oka Akoko, Ondo State, Nigeria to the family of the Late Mr. Joseph & Mrs. Veronica Arogundade, the third of eight children. He attended primary and Secondary School in Imoga and Ososo in Edo State between 1966 and 1978, as well as Mary Immaculate Grammar School, Ado-Ekiti. He did his Spiritual Year programme in Ekpoma and then proceeded to the Ss Peter & Paul Major Seminary, Bodija, Ibadan. In the course of his training he obtained B.A. in Religious Studies awarded by the University of Ibadan and a Bachelor of Theology from the Urban Pontifical University, Rome. The Coadjutor Bishop was ordained on 8 September 1990 by Bishop Francis Folorunso Alonge at the Sacred Heart Cathedral, Akure, Ondo State. 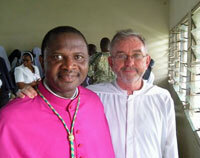 After Ordination, his first assignment was as Assistant Priest at St. Patrick’s Church, Ondo. He also took responsibility for Hospital Chaplaincy of Mater Maria Misericordia Hospital in Ondo. In 1996, he was transferred to St. George’s Ile-Oluji as the Parish Priest before leaving for Further Studies in the United States of America in 1997. While in the USA, he completed Post-Graduate Studies at Fordham University, Bronx, New York, Sexton Hall University, Newark, New Jersey and Fordham University, Lincoln Center, New York where he attained an M.A. and PhD. His studies and expertise in Pastoral Counseling helped the victims of the September 11 terrorist attack in New York to stabilize after such a shocking experience that shook not just the United States but the whole world. For the past 12 years the new bishop also ministered in the Parish of Our Lady of Mount Carmel, Elmsford, New York.